The Razor Blade Company carries a variety of blades for upholstery, fiber and fabric cutting. Our customers use our textile blades to shave props for stage, cut upholstery for bus refurbishments, craft fine leather interiors for luxury cars, meanwhile fabric and upholstery supply stores stock our products for general use. We serve a wide range of businesses f rom textile, car and bus upholstery, to tailoring and below we share the top blade choices of those satisfied customers. For your basic fabric cutting use, we recommend the traditional single edge blade shape in our extra sharp blade 94-307 which is double honed for excellent cutting potential. 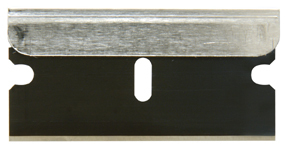 These blades are carbon steel with a thickness of .009” and have a non-rust aluminum backing. The double honed blade quality allows for sharp, clean fabric cutting. If you are looking for a blade with a longer lasting sharpness that holds up to long cuts or heavy fabric the 62-0163 Extra Keen Blue Single Edge blade is a top requested blade among our textile customers. Similar to the 94-307 blades, these extra keen blue blades are also carbon steel and have a thickness of .009” with a non-rusting aluminum backing. With these blue blades you will be able to work longer cutting your fabrics allowing for clean cuts without the need to change your blade mid-cut. Looking for a blade that can cut and trim through leather fabric? Try item 26-101, our number 26 hobby blade. This hobby blade is not only great for fabric cutting but is also used for cutting foam, linoleum, plastic, wood, and rubber. These blades have a thickness of .025” and are carbon steel. They are sold in bulk of 1000 blades per case, excellent for industrial uses. Other textile blades that we carry are the Gru Gru blade, Celanese blade, Hercules blade, Teijin Seiki blade, Krupp Blade, Mark IV tow cutter and the Mark V tow cutter. For more information on these blades please contact one of customer service representatives at (310) 452-1034.